Ever wish you could take your beautiful wedding cake home with you? You and all your guests enjoyed every last bite but now it is just a memory! Now, you can capture this sweet memory from your special day. Earthly Grace will recreate that tasty work of art as a miniature replica to treasure forever. Each cake is had crafted with extreme care and I typically spend 10 to 15 hours on each miniature. I work from images to ensure the fine details that make a cake unique are captured in the miniature. You also have the option of an ornament or a stand alone miniature. Mini cakes start at 75.00 and that would be for a two tier cake with just a few flowers. I would say most cakes are between 100.00 to 150.00 (plus shipping and VA sales tax if applicable). They typically have a three to four week lead time. 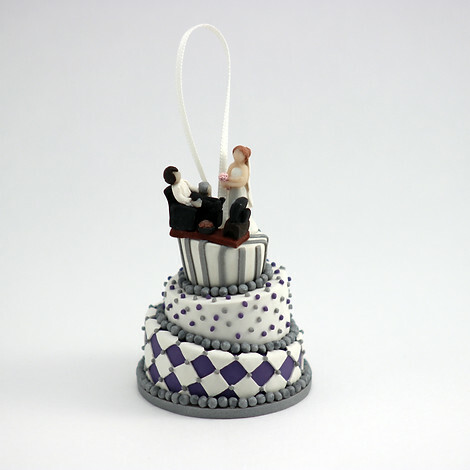 Each cake is crafted from polymer clay and ranges between 3" to 6" high, depending the height of the original cake. I think I may need to get my wedding cake done! !